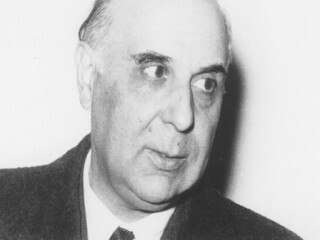 The Greek poet and statesman George Seferis combined a diplomatic career with the creation of a body of poetic works unique for their synthesis of modern man's anguished estrangement and the redemptive promise of an ancient artistic heritage. The son of a law professor who was a poet in his own right, George Seferis or Georgios Seferiadis, spent the first 14 years of his life at his birthplace, Smyrna (Izmir), Turkey. The Seferiadis family fled Asia Minor with the outbreak of World War I, taking up residence first in Athens, where George completed secondary school, then in 1918 moving to Paris, where his father pursued a law practice. Richly endowed from childhood with the poetic experience of a living, oral literature and encouraged by the example of his father, Seferis found himself very early divided between the exigencies of a practical and a literary career. While studying law in Paris, he began writing poetry, and his first titled composition (1924, published later), "Fog," dates from a stay in London, where Seferis had gone to perfect his English prior to taking the Greek Foreign Service examination. Seferis returned to Athens and to the Foreign Ministry in 1925, continuing to write verse and to produce translations and literary criticism until, in 1931, his first collection of poems, Strophe (Turning Point), appeared. Diplomacy summoned Seferis to London, where he served as vice-consul until 1934, all the while continuing to publish works (notably "The Cistern," 1932) in magazines and reviews. His next major collection—Mythistorema (Mythical Story, 1935)—represented an evolution away from the rigidly "pure," stylistically self-conscious early works toward the sober, almost denuded manner that marked the best of his mature poetry, keeping it attuned to real patterns of speech. Modern desolation for Seferis expressed itself amid particular ruins—the broken statues and columns of an immensely rich Greek heritage. The enduring materiality of these past creations weighed heavily on Seferis, living on for the poet as proof of human continuity, of a glorious but evolving Hellenism. In Kichle ("The Thrush," written during World War II), Seferis faced the ravaged modern world defiantly: "the fragments/ Are not the statues./ You are yourself the remains." But new ruins were being made of Greece. The poet-diplomat continued his dual service, fleeing with the Free Greek government during the Nazi occupation. His published works swelled by five volumes during the war: Himerologion katastromatos (Log Book) I, II, and III; Tet-radio gymnasmaton (Exercise Book); and Poiimata (Poems). Married in 1941, Seferis had journeyed with his wife Maria in official exile from Ankara to South Africa, to Cairo, and to Italy; he wrote all the while—including a group of Dokimes (Essays) in 1944—becoming more and more a recognized poet of his unsettled times. In 1947 Seferis received the Palamas Prize from the Athens Academy, and during the postwar years he held diplomatic assignments of ever-increasing responsibility. By the time he returned to Great Britain as Greek ambassador in 1957, his official stature in public service and in letters was already internationally recognized. Seferis retired from the Foreign Service in 1962. He won the Nobel Prize for literature in 1963. Seferis died in Athens on Sept. 20, 1971. View the full website biography of George Seferis.